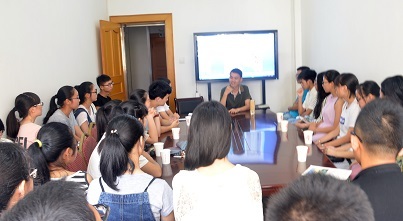 On Monday July 4th, Mr Hu, a few college graduates and college students, and I talked with 40+ high school graduates in Ningguo about college study and college life as well as financial aid re-application. This year, 71 of our supported high school students, some will go to work place and some will go to college. Some of them have already gone bigger cities to do summer jobs to help paying their tuition, and some are doing summer jobs locally for the same purpose. They appreciate the opportunities a lot. The college students/graduates' talk and experience have been very useful in the past to the upcoming college students. This year will be the same. 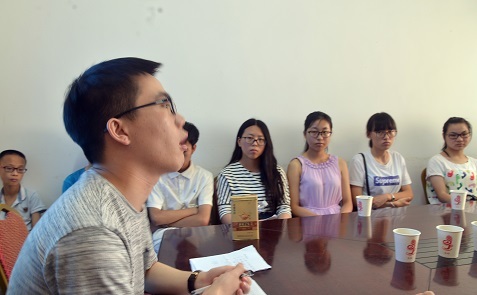 Xu Yinhao, graduated from a 3 year college in 2015 to get a tech job at Hefei. Three months later, he was promoted to a manager. 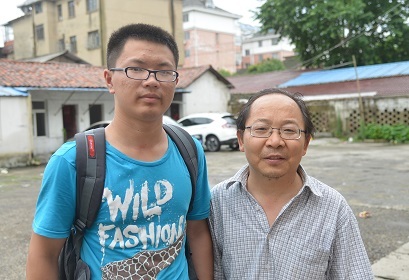 Last April, he, together with two friends, started a small internet company at Hang Zhou with 200K Yuan RMB of their own money (his share is smaller, from the money he earned last year and summers during of the previous summers). He gave up our support after two years in college. He was one of the poorest students we supported since elementary school. He started to work during summers in high school when others hire tutors to improve acadmics. His story was at least to a girl who told me later. That girl has started summer job locally and will give up our support as her family situation improved a little and she can work during breaks to reduce the burden. One of his most memorial words is: Always smile, it will get you good result. Nothing is too diffitult to overcome except death. 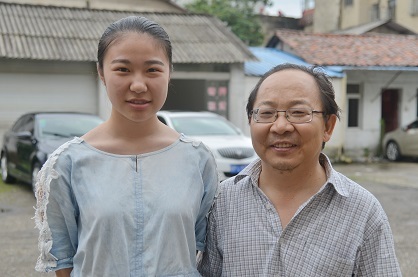 Wang Ting, also graduated in 2015 and found a job at a US company in Shanghai. 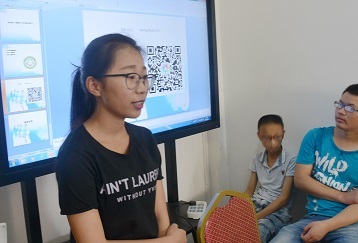 She donated 1000 Yuan from her first month salary to the Zhong Mei Ai Xin (our partner in China). 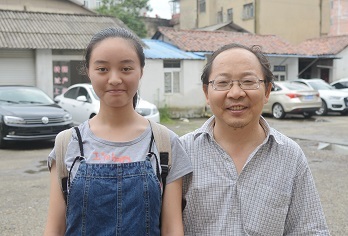 For various family reason, she will come back to Ningguo to become a teacher at a local vocational high school to teach the students some practical tech. 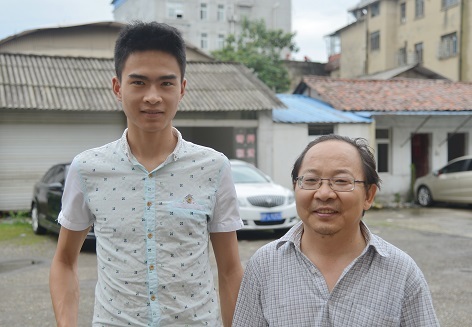 Zhao Ren Jie just graduated from Nanjing Aero University and will continue his graduate study there. 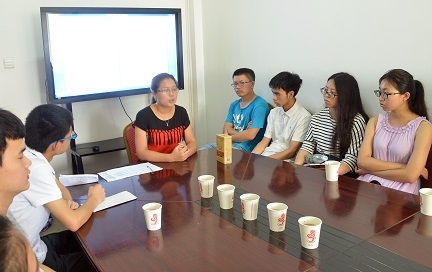 Zhang Qiuyan, a 2nd year college students, told her experience in college. Questions and answers with students. 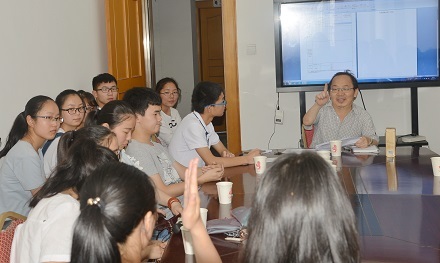 Sun Ting, just graduated from Beijing Normal University and come back to Xuan Cheng to teach high school students (part of the deal for tuition waiving). Although she has given up support since 2nd year in college, she continued to volunteer and support this program. 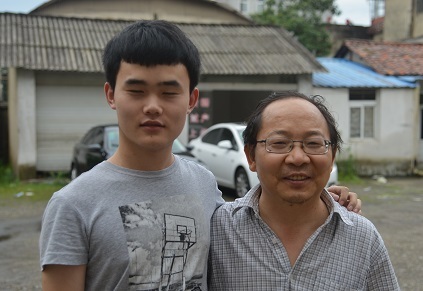 Xiao Jianping, just gave up our support and will continue to be part of our program, volunteering and so on. 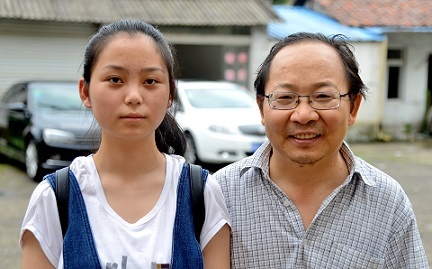 She was very much inspired by Xu Yinhao's story and life attitude. The below are some samples of high school students attending the meeting.